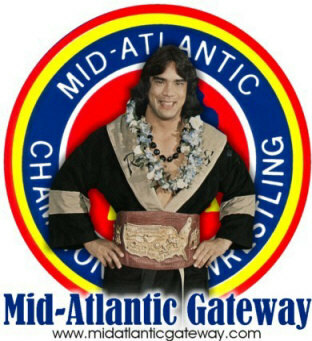 of Mid-Atlantic Wrestling . . . 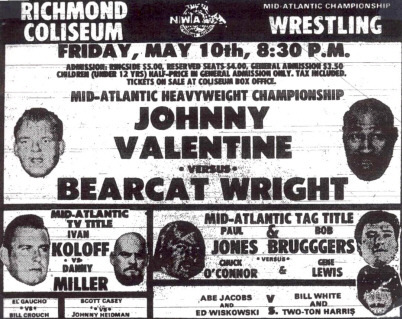 This section remains "under construction" as we try to find clippings or other supporting documentation for title changes for the Mid-Atlantic era titles. 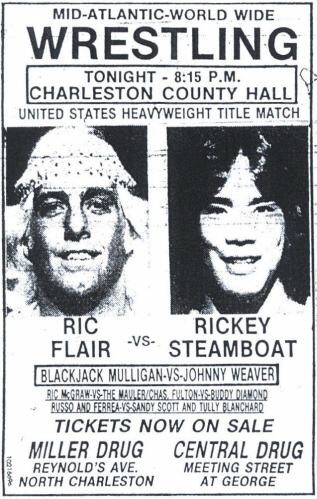 Ricky Steamboat wins the U.S. title from Ric Flair in Charleston's County Hall! 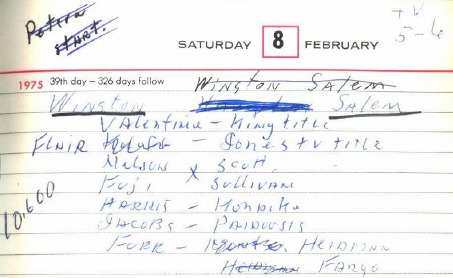 Special thanks to the contributions of Mark Eastridge, Allan Barrie, and Sam Finley, and Carroll Hall who have assisted us greatly in our title change histories. 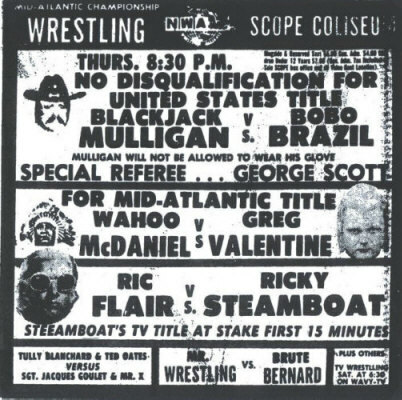 As we have time to locate clippings or other confirmation of title changes we will report them here. 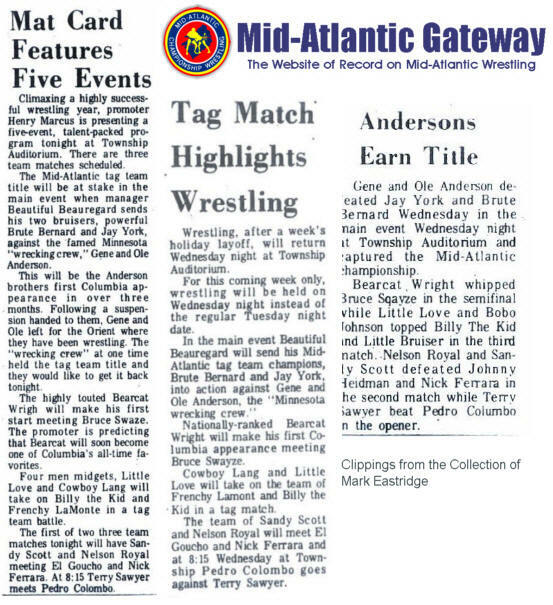 The Anderson Brothers were announced on Mid-Atlantic television as having won a tournament in California to become the NWA World Tag Team Champions. 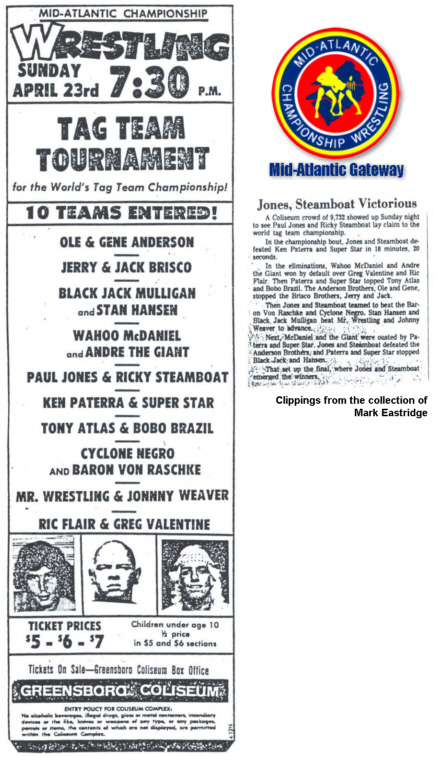 They defeated Dino Bravo and Gino Brito in the finals of the tournament. Fictitious Tournament to establish championship. 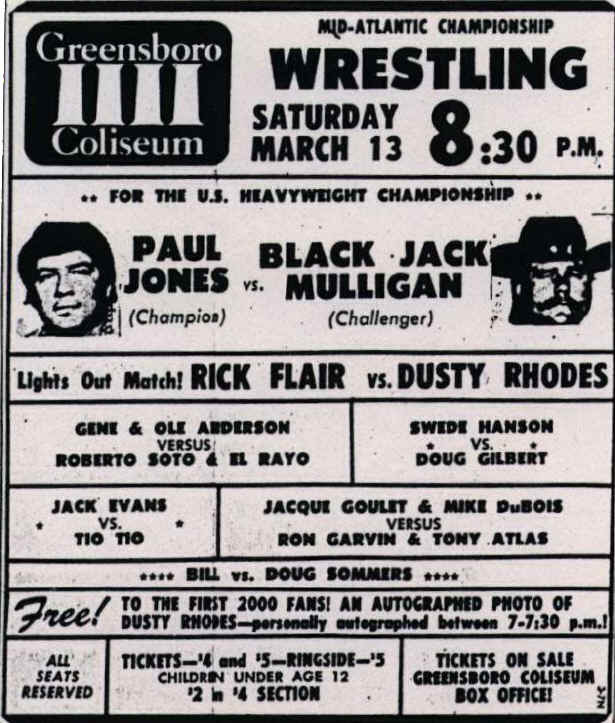 Broadcast date February 1, 1975. 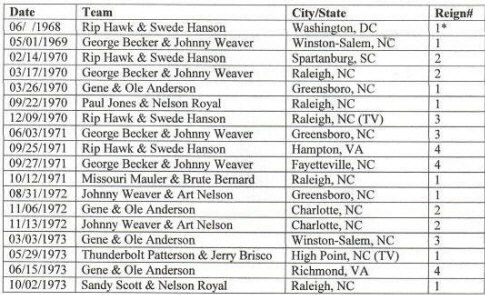 6/11/75 at WRAL TV studios, Raleigh, North Carolina. 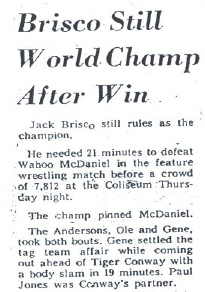 The famous "supreme sacrifice" match where Ole Anderson throws Wahoo McDaniel into the head of his brother Gene. 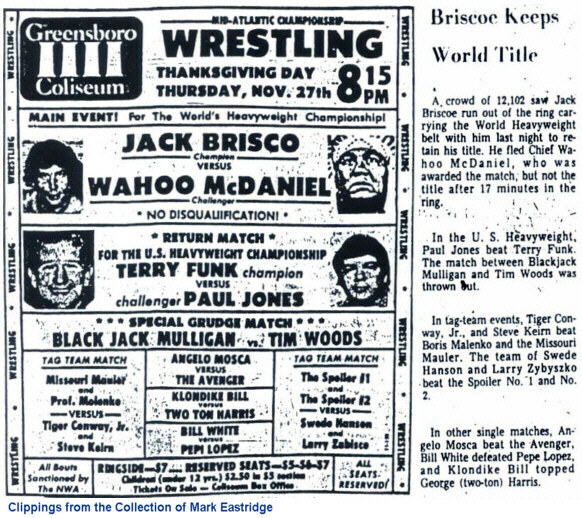 NOTE: Most published title histories list Tiger Conway, Jr. and Steve Keirn as winning the World Tag Team titles from the Andersons on 11/3/75 in Charlotte. Research has proven this not to be the case. 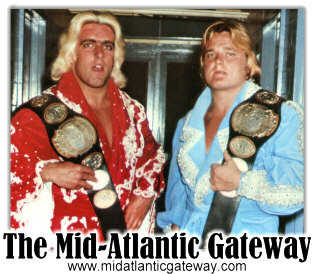 Keirn and Conway never held the NWA World Tag Titles. For full details, CLICK HERE. 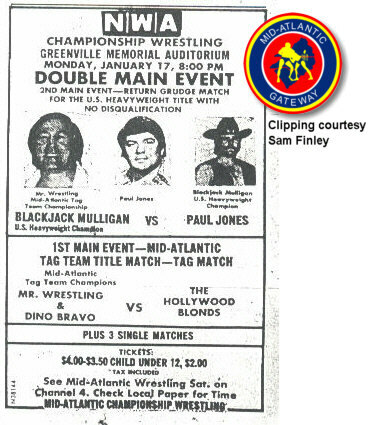 6/28/76 at the Greenville Memorial Auditorium, Greenville, SC. 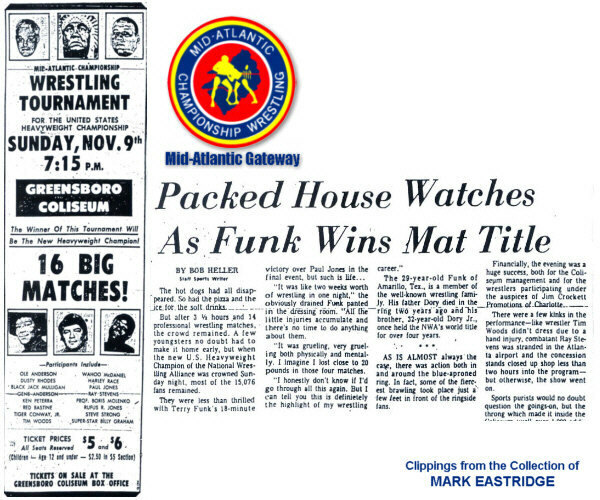 GEORGIA CHAMPIONSHIP WRESTLING NOTE: Some published title reports show Mr. Wrestling I & II winning the World Tag Team titles from the Andersons during this time. This was not the case. 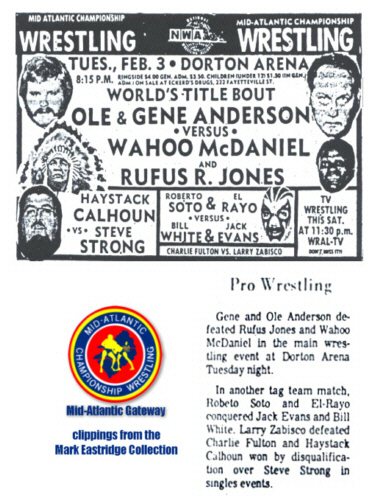 Mr. Wrestling I & II won and lost the Georgia tag team titles to the Andersons. 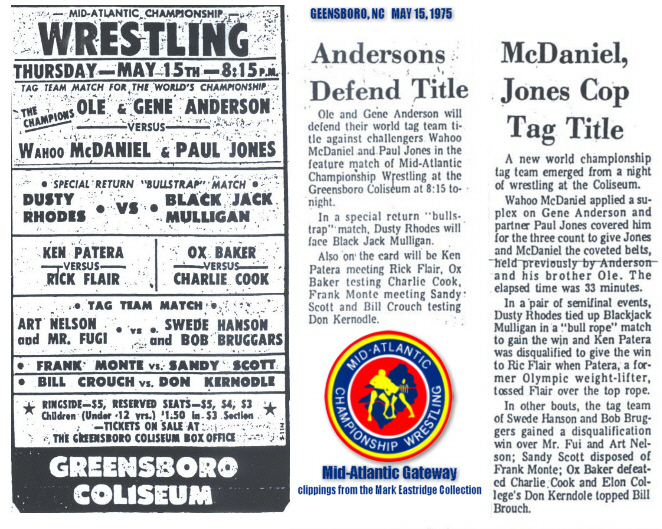 The Andersons held both the world tag and Georgia tag titles at the same time during part of the year, which has apparently created that confusion. 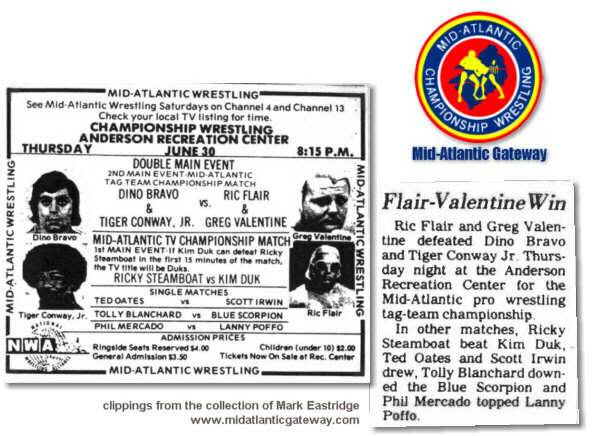 Flair & Valentine stripped of the titles for continually getting disqualified to retain the titles. 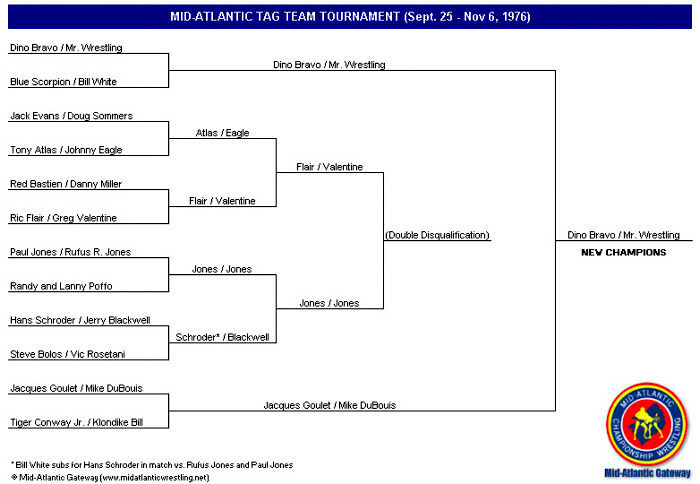 Defeated Masked Superstar and Ken Patera in the finals of a one night/ten team tournament for the vacant title. 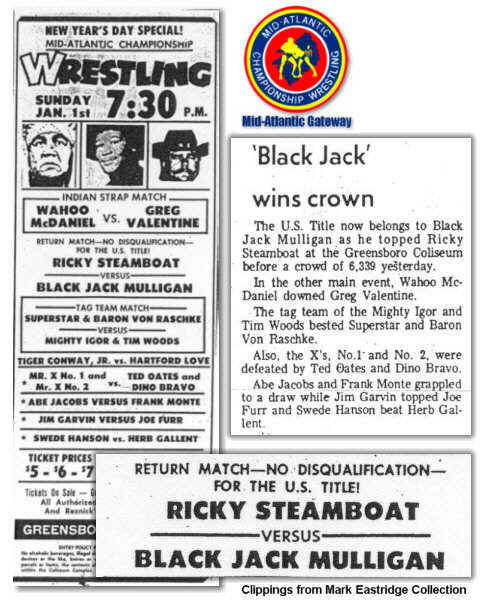 As we find clippings and specifically verify additional title changes, we will post them here. 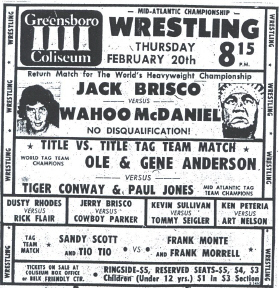 Brought into Greensboro by Crockett Promotions as US Champion. 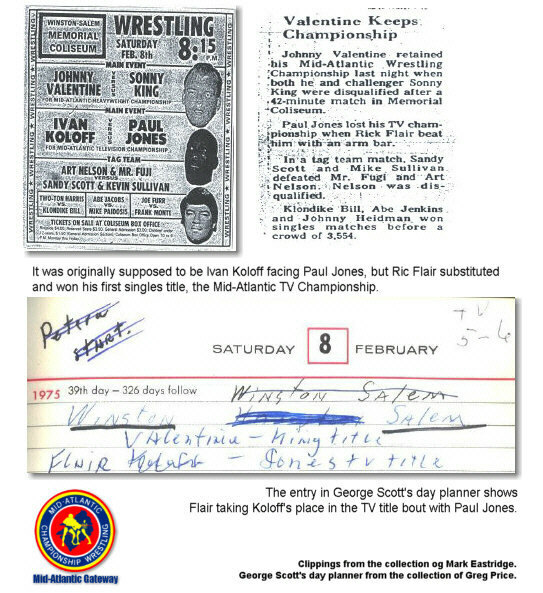 Won title in fictitious tournament in Florida, defeating Johnny Weaver in the finals. 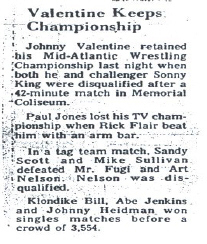 Title vacated following 10/4/75 Wilmington NC plane crash which ended the career of reigning champion Johnny Valentine. 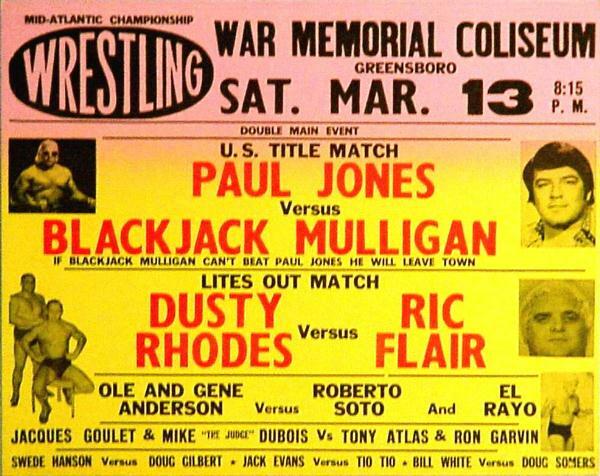 Defeats Paul Jones in the finals of a one-night US Title tournament. 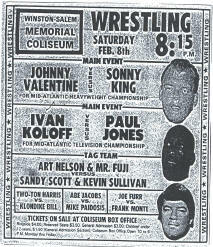 Fills vacancy following the 10/4/75 Wilmington NC plane crash which ended the career of reigning champion Johnny Valentine. 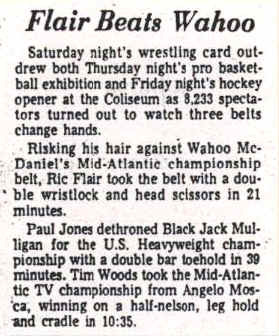 Jones pins Blackjack Mulligan to win U.S. 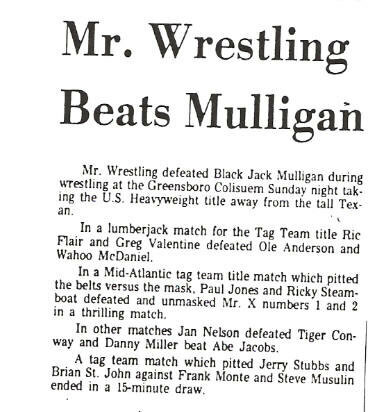 Title, but Mulligan files a post match protest challenging the title switch with the NWA Board of Directors. 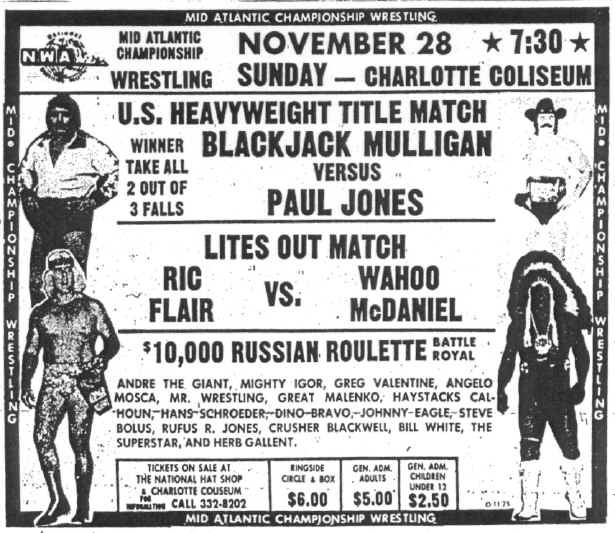 On the Mid-Atlantic Championship Wrestling TV show that aired on Saturday, December 18, 1976, Jim Crockett, Jr. forces Paul Jones to turn the U.S. 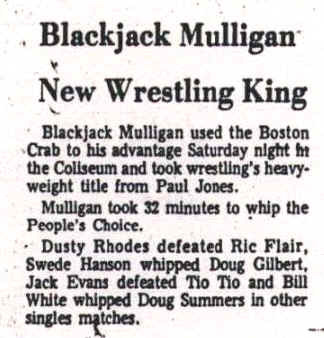 Title back over to Blackjack Mulligan after NWA President Eddie Graham in a video taped ruling upholds Mulligan’s protest and requires the title to be returned to Mulligan. 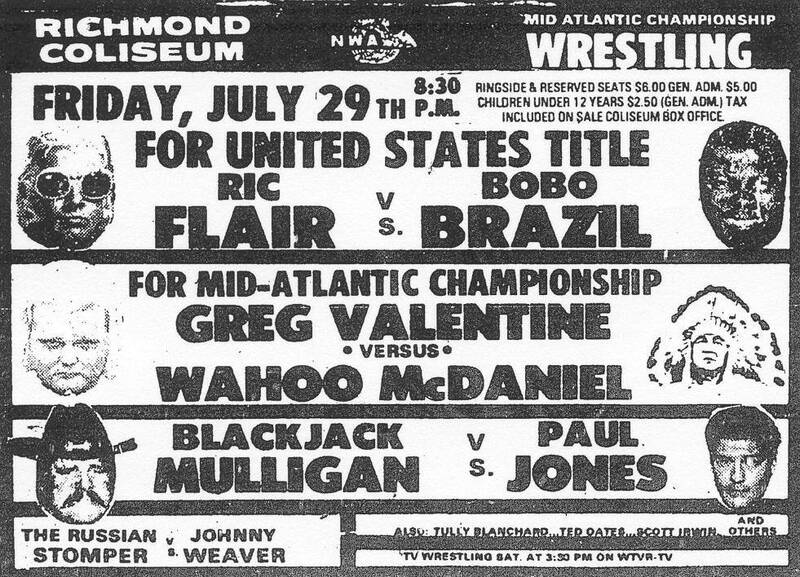 Crockett version of the US title. 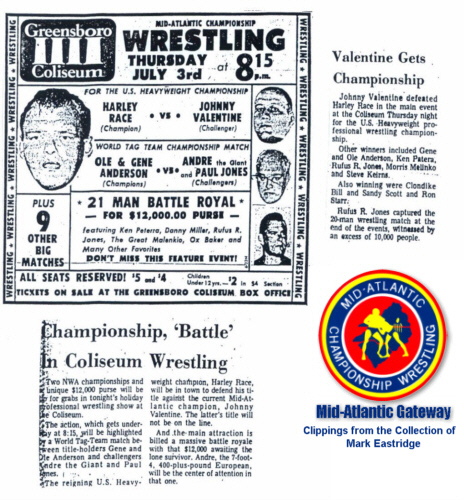 This title evolved from the Atlantic Coast Tag Team Championship which was created in June of 1968. 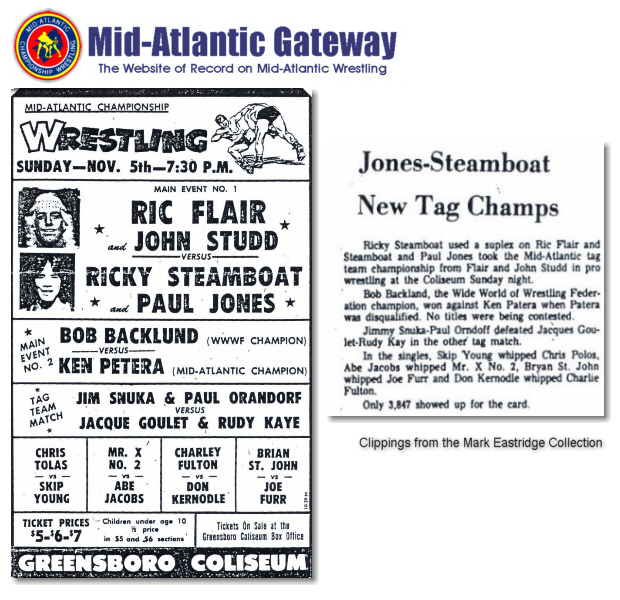 10/3/73 - First Mid-Atlantic Tag Team Champions. 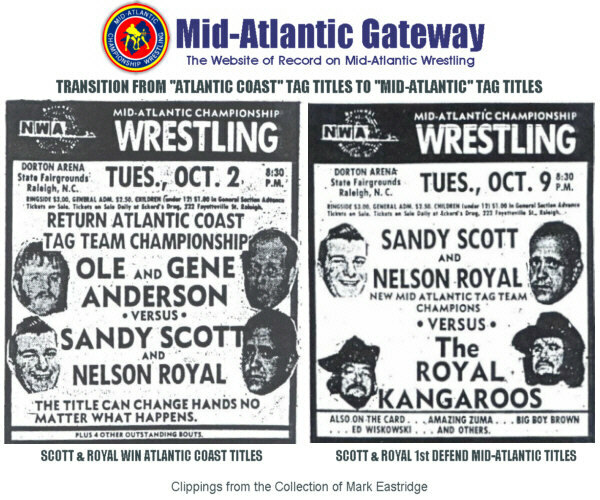 Scott and Royal defeated Gene and Ole Anderson on 10/2/73 in Raleigh NC for the Atlantic Coast Tag titles. 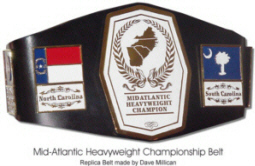 On the WRAL TV taping on 10/3, they were presented with new Mid-Atlantic tag belts. 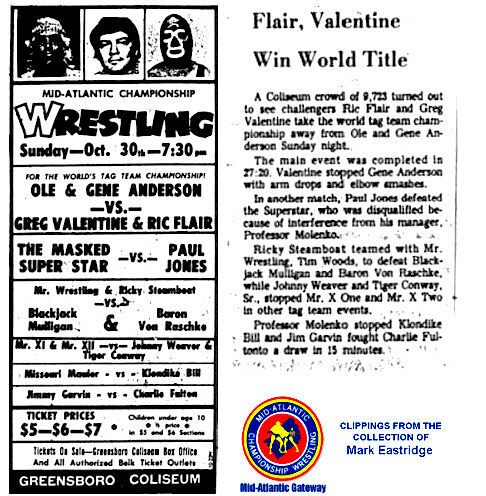 First title defense of new Mid-Atlantic titles on 10/9/73 in Raleigh vs. The Royal Kangaroos. 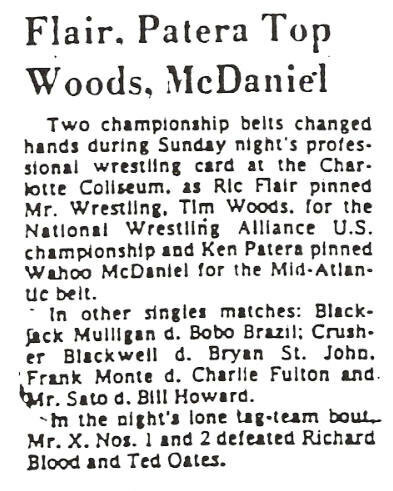 However, there is a newspaper article that ran before the Thanksgiving card in Charlotte (11/22/73) that reported that Bernard and York were defending the titles. A 2nd article said Scott and Royal were reigning champions. 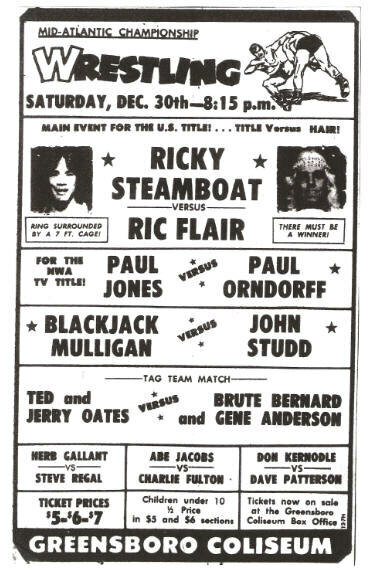 cott and Royal were still billed as champions on 11/2, but by 11/12 it appears they are no longer teaming regularly. Still working to nail down this one! 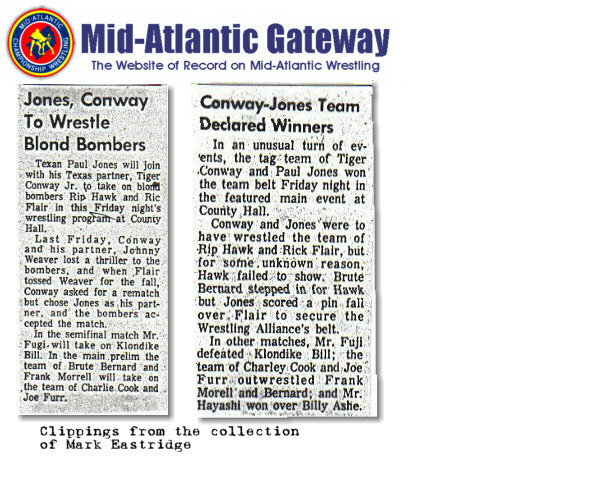 PHOTO, POSTER, NEWSPAPER AD, RESULT AND MORE: "THE GATEWAY REMEMBERS"
Paul Jones & Tiger Conway Jr.
Brute Bernard substitutes for Rip Hawk, but the titles remained on the line. 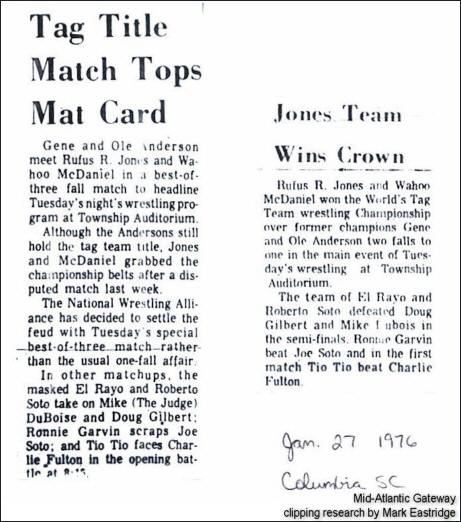 Jones pinned Flair to win the belts. 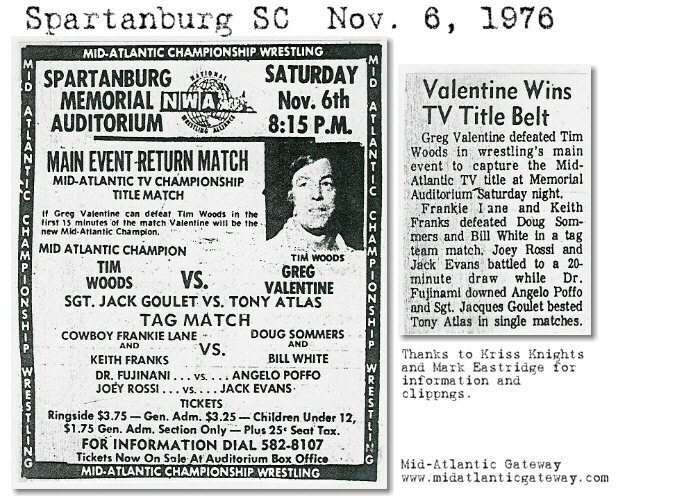 after winning the NWA World Tag Team titles in January of 1975.
in finals of the tournament that aired on Saturday, November 6, 1976. 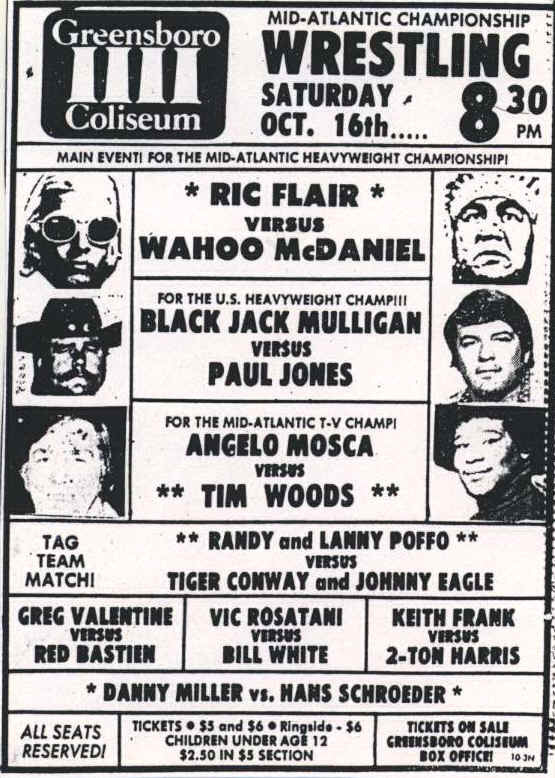 Dino Bravo & Tiger Conway, Jr.
8/22/77 Charlotte Coliseum, Charlotte, NC. 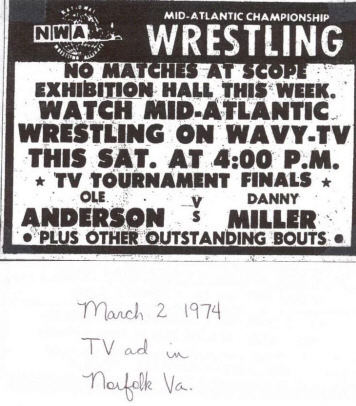 Source: Actual TV audio of this title change match has been uncovered, with local promos for matches in the area helping us establish the date of the TV taping. 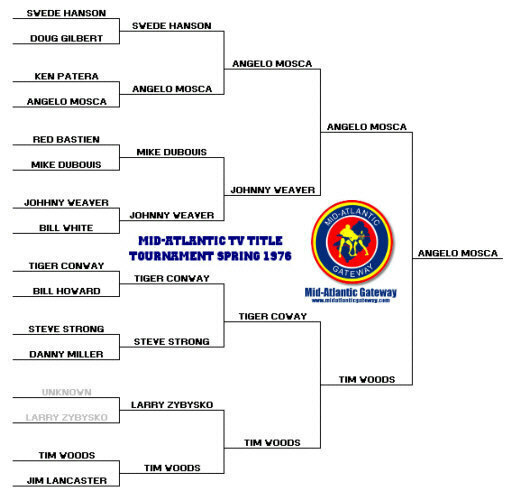 Tournament being conducted on Mid-Atlantic television. 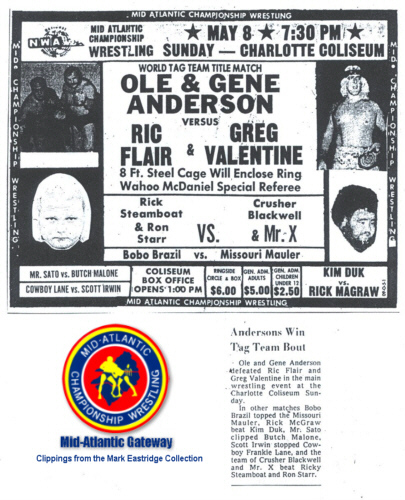 6/30/76 at WRAL TV studios in Raleigh, NC. 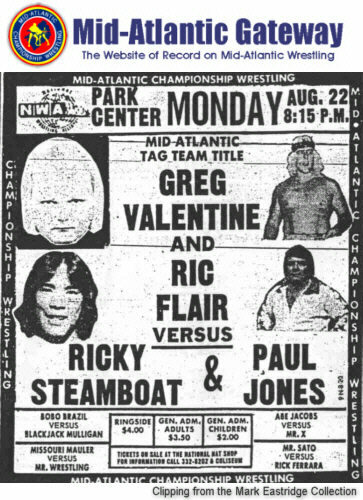 Broadcast Date 7/3/76. 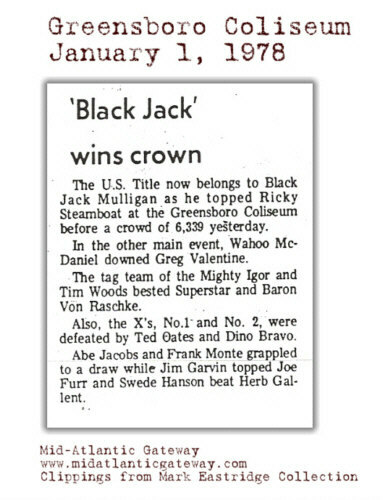 Won title from Tim Woods 11/6/76 in Spartanburg S.C. 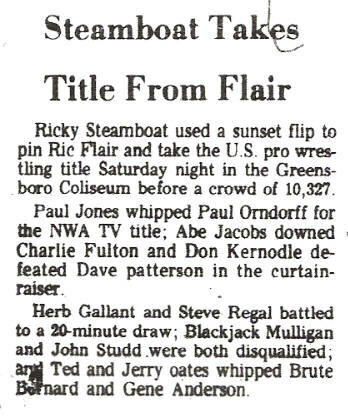 Title change also reported to have taken place 11/8/76 in Fayetteville NC. We have no confirmation of that change. 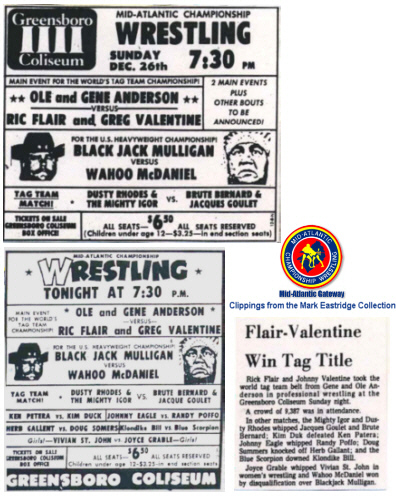 This is one of those rare occasions where the title change hands twice in different cities on different dates. 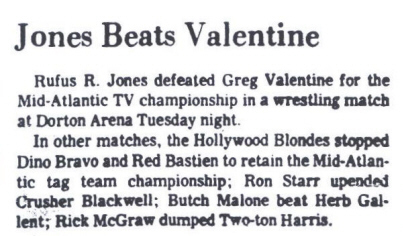 In this case, Rufus first beat Valentine on Tuesday 2/15 in Raleigh for the title. 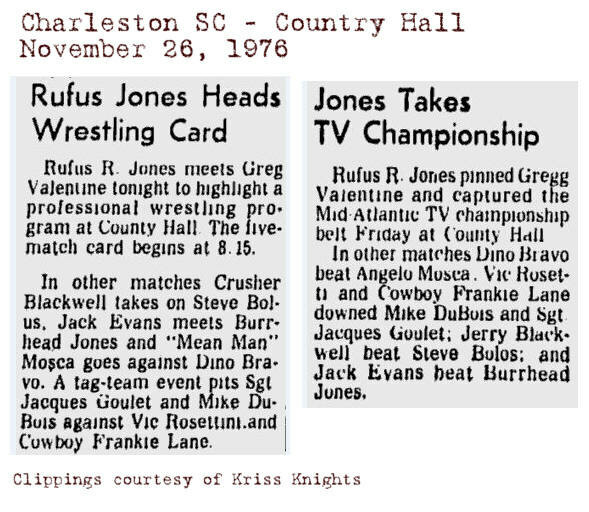 Rufus then beat Valentine again on Friday 2/18/77 in Charleston. 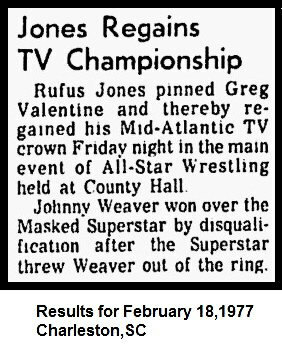 The Raleigh change (#1) would have been announced at the TV taping on Wednesday night 2/16 in Raleigh, so when the announcement aired on Television on Saturday 2/19/77. both "changes" would have already happened and fans in both cities would never know the difference. 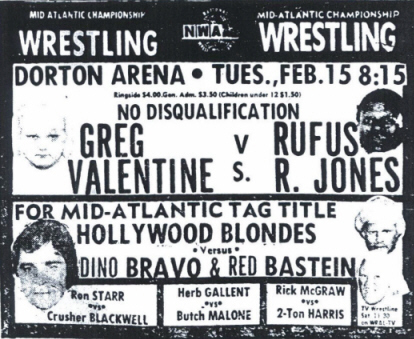 This type thing was rare, but did happen on several occasions on the 1970s and 1980s. Thanks to Allan Barrie and Carroll Hall for confirmation on these title changes. 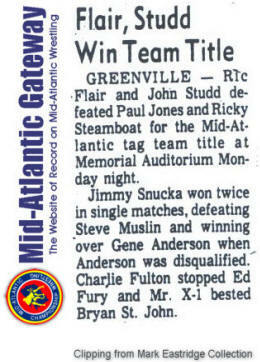 Previously reported as 4/4/77 Greenville Mem. Aud. 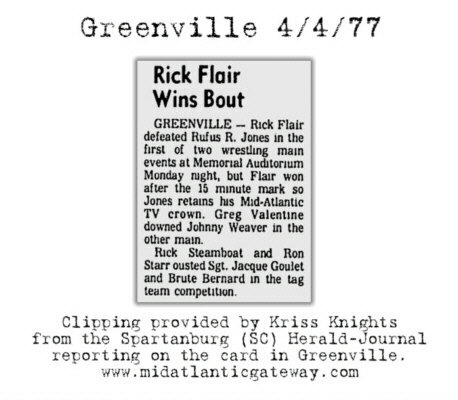 Greenville, SC, but a clipping from the Spartanburg Herald-Journal referencing the Greenville results says Flair beat Rufus outside of the 15 minute time limit to win the title at the time. 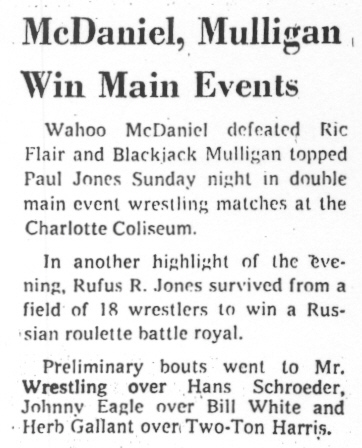 Newspaper results on wrestling in those days frequently had erroneous information, but this clipping, along with clippings weeks later in April showing Rufus still TV champ, put the widely published date of 4/4/77 in major doubt. 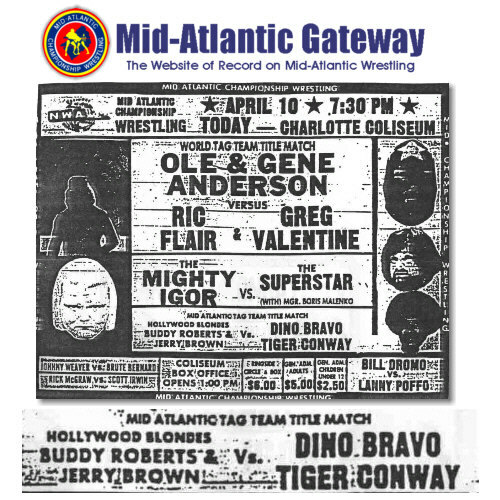 The only record of them meeting that we can find is 4/17/77 in Savannah GA. 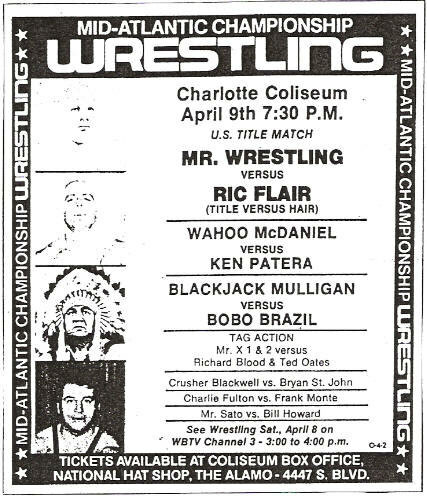 Flair was definitely TV champ by early May. 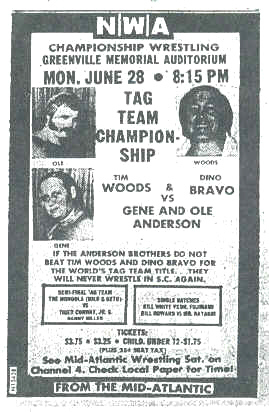 6/15/77 at WRAL Studios, Raleigh, NC. ADDING FURTHER SUPPORTING CLIPPINGS SOON! 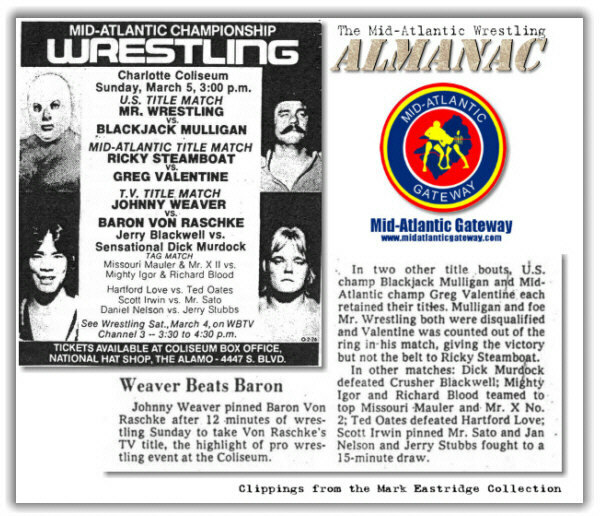 Baron Von Raschke announces on Mid-Atlantic Championship Wrestling television that aired from the WRAL studios in Raleigh, North Carolina on March 4, 1978 (taped 3/1/78) that he will enter a national Tournament of TV Champions featuring other TV champions from other NWA territories around the nation. 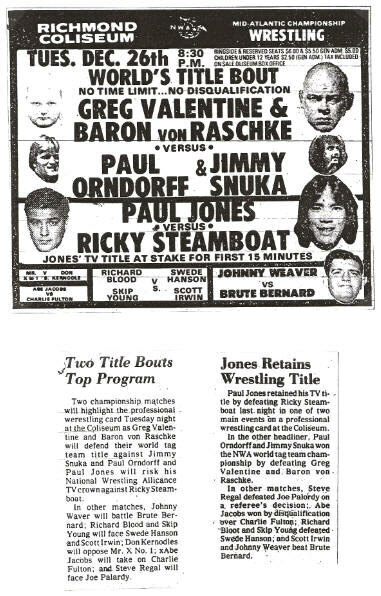 Date of tournament determined by researching other title defenses between the two television tapings on 3/1 and 3/8/78. 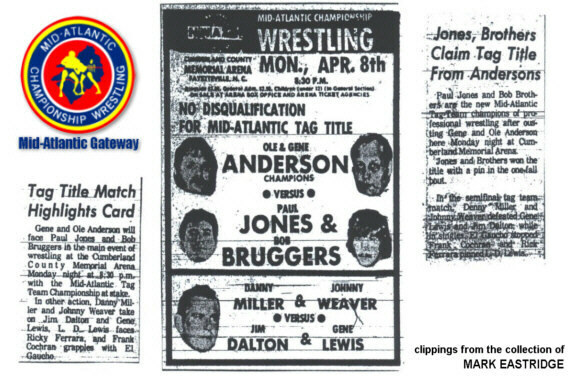 The Baron defended the Mid-Atlantic TV title against Paul Jones in Fisherville VA on 3/2/78. 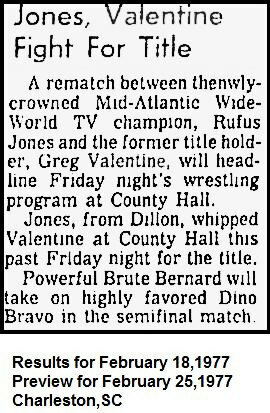 This is the only TV defense documented between the two TV tapings, the 2nd of which was announced that Baron had won the TV tournament. * Accurate Title reign number to be determined following additional research.